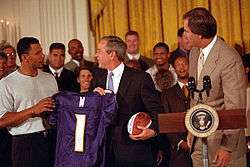 The 2000 Baltimore Ravens season was the franchise's 5th season in the National Football League (NFL) and the second under head coach Brian Billick. The Ravens concluded their season with a 12–4 record, and came in for second place in the AFC central, and also earning them a spot in the playoffs as a wild card team. The Ravens won three straight games in the 2000 AFC playoffs, culminating in a trip to Tampa Florida for Super Bowl XXXV, where they defeated the New York Giants, 34–7. The team's defense, which allowed 10.3 points per game in the regular season, is considered among the greatest of all time. The Ravens spent most of the off-season concerned with the status of their star linebacker Ray Lewis, who along with two other acquaintances, was arrested and charged with murder after an incident outside of an Atlanta nightclub on January 31, 2000. On June 5, a plea bargain was struck, and murder and aggravated assault charges were dropped in exchange for testimony against his companions. Lewis pleaded guilty to one count of obstruction of justice and was sentenced to a year of probation. The Ravens started the season with a 5–1 start, with three of their victories coming by shutout. Despite the great play of the defense, the offense hit a major swoon after the first month of the season. Following a 37–0 victory over the Cincinnati Bengals, the Ravens would not score a touchdown for five consecutive games. The Ravens won the first two of these games thanks to their defense, but lost the next three, including a critical division loss at home to the Tennessee Titans. During this game, quarterback Tony Banks was benched in favor of Trent Dilfer, who would take over for the rest of the season. After a loss at home to Pittsburgh, the Ravens broke both their touchdown-less streak and losing streak against the Bengals the next week. It would be the first of seven straight wins to end the season. The Ravens finished one game behind the Tennessee Titans in the AFC central, so the Ravens had to begin their playoff run at home in the wild card round against the Denver Broncos. The team cruised to a 21–3 victory, setting up a date with the Titans the following week in Nashville. The Ravens prevailed 24–10, thanks to linebacker Ray Lewis' 50 yard interception return for a touchdown that put the game away. The team then traveled to Oakland to meet the Raiders for the right to represent the AFC in the Super Bowl, and the Ravens advanced to their first, 16–3, as the defense held Oakland, the league's top rushing offense during the season, to just 24 yards rushing. The Ravens easily defeated the Giants in Super Bowl XXXV, 34–7, as Ray Lewis led another dominant performance by the defense and was named most valuable player of the game for his efforts. The Ravens relied heavily on their defense, which set several records during the 2000 season, including fewest points allowed during a 16-game season (165) and fewest rushing yards allowed (970). The defense finished the season number one overall in points allowed, and Ray Lewis was named defensive player of the year by the Associated Press. Starting cornerbacks Chris McAlister and Duane Starks combined to intercept ten passes, and defensive end Rob Burnett contributed with 10.5 sacks. Offensively, the Ravens relied heavily on the running game. Rookie running back Jamal Lewis led the way with 1364 yards and veteran Priest Holmes added 588 yards. The passing game was rather pedestrian (23rd in yards passing), but Trent Dilfer brought stability to the position when he took over for Tony Banks mid-season. Tight end Shannon Sharpe, acquired as an unrestricted free agent from Denver during the offseason, was the team's leading pass receiver with 67 catches for 810 yards. Punt returner Jermaine Lewis scored two touchdowns on punt returns during the season, and ran back a kickoff in the Super Bowl, while placekicker Matt Stover made 35 field goals on 39 attempts. 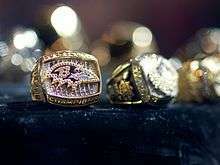 The 2000 Ravens team were Baltimore's first playoff appearance in 23 years, when the Baltimore Colts were AFC East champions and made it to the AFC Divisional game in 1977. The Ravens defense in 2000 is often named among the greatest NFL defenses of all time. A 2007 ESPN Page 2 list ranked the 2000 Ravens defense at #3 in NFL history. Baltimore gave up only 970 rushing yards (60.6 per game) all year, an NFL record for a 16-game season, and 186 fewer yards than the next lowest team, Baltimore's Super Bowl XXXV opponent, the New York Giants. Baltimore gave up only five rushing touchdowns all season, and allowed a paltry 2.7 yards per rush, both league bests. Baltimore only allowed 165 points all season, also an NFL record for a 16-game season. Furthermore, the Ravens recovered an astronomical 26 fumbles during the season, double the total the second-ranked team. Statistical site Football Outsiders noted, "One more interesting note on the Baltimore defense: it was the only dominant defense of the past few years to be based on stopping the run instead of controlling the pass. For all the cliches about the need to stop the run, in general the best defenses are ranked the highest because they have the best ratings against the pass, not against the run – just like the best offenses are ranked the highest because they are the best through the air, not on the ground. The 2000 Ravens only rank seventh in defense against the pass, but their rushing defense ... is far and away the best of the past six seasons." In the opening game for Baltimore's regular season, they squared off against division rivals Pittsburgh Steelers at their turf. In a game where the Ravens had 336 yards of total offense, they first scored points with a field goal kick from Matt Stover. Later in the first quarter, Qadry Ismail would catch a pass from Tony Banks for seven more points. After another field goal kick, the Steelers were being shut out by the end of halftime, 13–0. The final score in the game resulted from another field goal from Stover, and the final score resulted with the Ravens winning 16–0. With this win, the Ravens began their season at 1–0. At the Ravens first home game, Baltimore trailed the Jacksonville Jaguars for the majority of the game, where the home team gained another 300+ yard total offense. The first quarter was dominated by Jacksonville, where the time period ended with 2 field goals from Mike Hollis and a touchdown pass from Mark Brunell to Jimmy Smith (13–0). Baltimore put up their first points in the second quarter with a touchdown pass from Tony Banks to Travis Taylor. However, the first half ended with two more field goals from the Jaguars. The third quarter began with the Ravens trailing 23–7. Two further touchdowns by the Ravens (one which was for two extra points) and a field goal from Jaguars put the home team with less than a touchdown differential. In the continuing scoring shootout, the Ravens scored first in the fourth quarter with a touchdown to lead for the first time during the entire game, 29–26. By the later portion of the quarter, the Jaguars had surpassed Baltimore once more at 36–32. In the last scoring drive of the game, Shannon Sharpe completed a 29-yard pass from Banks to defeat Jacksonville, 39–36. With this win, Baltimore's record elevated to 2–0. In week 3, the Ravens and the Miami Dolphins gained little offense in a defensive struggle for both teams. The first half was led by the Dolphin's placekicker Olindo Mare with two field goals. The Ravens attacked back during the second half, with two field goals of their own by Matt Stover; however, with a touchdown pass from Jay Fiedler to Lamar Smith and a rushing touchdown from the latter player, the Dolphins overcame Baltimore 19–6. In a game where the Ravens got just above 250 yards of total offense, Baltimore ultimately fell to a 2–1 record. In an attempt to redeem their road lost to the Dolphins, the Ravens faced division rivals Cincinnati Bengals. In a complete shut out, the Ravens gained a near 400 yards (391 yards exact) in a game where the defense shut down the Bengals for only 94 yards of offense. During the first half, the Ravens scored three touchdowns (two passes from Tony Banks to Travis Taylor and Shannon Sharpe, and a rush by Jamal Lewis) and a field goal by Matt Stover. The second half ended with two more field goals and a rushing touchdown from Obafemi Ayanbadejo to finish with a score of 37–0. With this win, Baltimore's record elevated to 3–1. The Ravens began a five–game touchdown drought with their matchup against Cleveland. In a game dominated by both defenses, the Ravens allowed just under 250 offensive yards. The first half ended with three field goals from kicker Matt Stover, with the longest being from 45 yards in order to advance the Ravens to the locker room at 9–0. The final scoring in the game came during the third quarter when Stover kicked another field goal from 22 yards. In a shutout for the Browns, the Ravens improved their record to 4–1. Baltimore would travel back to Jacksonville in a Week 2 rematch against the Jaguars at their turf in Jacksonville. The Ravens went with their second consecutive game without a touchdown with their kicker Matt Stover delivering all their points. In the first quarter, Jaguars kicker Steve Lindsey delivered a 49-yard field goal but was answered with a Stover 47-yard field goal to tie up the game. The second quarter ended with another Stover kick that would take the game to halftime with the Ravens winning 6–3. Stover would kick three more consecutive field goals to increase the score to 15–3, but the Jaguars retaliated with the final score of the game: a 1-yard rushing touchdown from Fred Taylor. However, the game was ultimately decided at 15–10 and the Ravens record elevated to 5–1. The Ravens traveled to their Capital Beltway neighbors, Washington Redskins, for their third straight road game. In a defensive struggle, both teams allowed under 250 yards of total offense. Halftime ended with both teams tied at 3–3 as a result of two field goals: one from the Redskins (37 yards by Kris Heppner) and the Ravens (Matt Stover from 51 yards). That field goal from Stover would be the only score that the Ravens put up in this game, where in the fourth quarter, Stephen Davis ran for a 33-yard touchdown that put Washington 10–3 over the Ravens. With this final score, the Ravens suffered their second loss and fell to 5–2. In Week 8, the Ravens flew back home to face off against division rivals Tennessee Titans. The Ravens continued their touchdown-less streak, where Matt Stover produced the only score for Baltimore with two field goals (from the 21 and 38-yard lines). In the second quarter, Titans quarterback Steve McNair threw a 9-yard pass to Rodney Thomas to go ahead of the home team. Just under one point, the Ravens sought to get ahead of Tennessee, however, Tony Banks produced a game high of 3 interceptions, with the last one being the game winner for the Titans as they won 14–6. With this loss, the Ravens fell to 5–3. In a rematch from week 1, Baltimore continued their streak without a touchdown. However, second-string quarterback Trent Dilfer started in replacement of Tony Banks, who in the past four games had not thrown one touchdown but rather more interceptions. In this game, unlike Banks, Dilfer threw no interceptions but was unable to connect with any receiver into the endzone. The Ravens had the advantage heading into halftime with two field goals from Matt Stover that were over 40 yards. In the third quarter, the Steelers retaliated with six points of their own as a result of a touchdown and a missed extra point from Kris Brown. In a Week 4 rematch, the Ravens traveled to Ohio against AFC Central adversaries, Bengals. Matt Stover put the Ravens on the board with three points after a 38-yard field goal in the first quarter. Baltimore entered their season best second quarter in this game with three touchdown passes from new starting quarterback Trent Dilfer that had the Ravens up by 24 unanswered points. Cincinnati answered with a touchdown, and their only score, during the third quarter with Peter Warrick's 4-yard rush. The game came to a close following a field goal from Stover that had the Ravens defeat the Bengals 27–7. The Ravens improved their record to 6–4 and began a seven-game winning streak. Just after battling against Tennessee three weeks earlier, Baltimore traveled to Nashville to face off against the Titans. The Ravens attacked by adding seven points to their score in the first quarter after a reception by Qadry Ismail from Trent Dilfer. Jamal Lewis would then double the points with a 2-yard rush that put up the Ravens 14–0 during the second quarter. The Titans answered with two touchdown passes from Steve McNair to Derrick Mason and Lorenzo Neal, respectively. After a field goal from Matt Stover, halftime stood at 17–14, favoring the Ravens. In a defensive struggle in the third quarter, no team was able to score. However, the game became tied at 17–17 with a 23-yard field goal from Al Del Greco upon the final quarter. Tennessee sought to end the game after Perry Phenix intercepted a pass from Dilfer and returned it 87 yards for a touchdown; however, Del Greco failed to convert the extra point. This allowed the Ravens to end the game with a touchdown pass to Patrick Johnson from Dilfer and a successful extra point conversion. With this win, the Ravens raised their record to 7–4 and became the first team to defeat the Titans in Adelphia Coliseum. Middle linebacker Ray Lewis was named NFL Defensive Player of the Year by the Associated Press. Five players represented the Ravens in the Pro Bowl: Lewis joined defensive tackle Sam Adams, safety Rod Woodson, offensive tackle Jonathan Ogden, and kicker Matt Stover. Matt Stover joined Lewis and Ogden on the associated press' All-Pro first team. Defensive end Rob Burnett joined Adams and Woodson on the AP All-Pro second team. ↑ "Ravens forge a curtain of own". Baltimore Sun. 2000-09-04. Retrieved 2016-01-30. ↑ "Ravens all wet in Miami loss". Baltimore Sun. 2000-09-18. Retrieved 2016-01-30. ↑ "Cincinnati Bengals/Baltimore Ravens NFL recap on ESPN". Static.espn.go.com. 2000-09-24. Retrieved 2016-01-30. ↑ "Ravens fill in blank once more". Baltimore Sun. 2000-10-02. Retrieved 2016-01-30. ↑ "5-1 Ravens give Jags the boot". Baltimore Sun. 2000-10-09. Retrieved 2016-01-30. ↑ "Redskins pick off Ravens". Baltimore Sun. 2000-10-16. Retrieved 2016-01-30. ↑ "End zone again out of bounds". Baltimore Sun. 2000-10-23. Retrieved 2016-01-30. ↑ "No end to Ravens' zone". Baltimore Sun. 2000-10-30. Retrieved 2016-01-30. ↑ "Touchdown! 'Curse over'". Baltimore Sun. 2000-11-06. Retrieved 2016-01-30. ↑ "Wide smiles for Ravens". Baltimore Sun. 2000-11-13. Retrieved 2016-01-30. ↑ "Big D runs into bigger 'D'". Baltimore Sun. Retrieved 2016-01-30. ↑ "Cleveland Browns/Baltimore Ravens NFL recap on ESPN". Static.espn.go.com. 2000-11-26. Retrieved 2016-01-30. ↑ "San Diego Chargers/Baltimore Ravens NFL recap on ESPN". Static.espn.go.com. 2000-12-10. Retrieved 2016-01-30. ↑ "Baltimore Ravens/Arizona Cardinals NFL recap on ESPN". Static.espn.go.com. 2000-12-17. Retrieved 2016-01-30. ↑ "Ravens get last word on Jets". Baltimore Sun. 2000-12-25. Retrieved 2016-01-30. ↑ "Baltimore Ravens 3 at Washington Redskins 10". 2000-10-15. Retrieved 2012-01-12. ↑ "Riding high". Baltimore Sun. 2000-12-31. Retrieved 2016-01-30. ↑ "Block party". Baltimore Sun. 2001-01-08. Retrieved 2016-01-30. ↑ "Ravens romp in Super Bowl, 34-7". Baltimore Sun. 2001-01-29. Retrieved 2016-01-30.